Residents of the political capital and the financial capital of Bangladesh, Dhaka and Chittagong respectively, have started suffering immensely especially in this month of Ramadan due to heavy rainfall. With the onset of monsoon in Bangladesh both the cities went under knee-deep water bringing traffic to a standstill. Every year most of the areas in these two cities suffer in this manner due to the failure of the government to keep the cities free from water logging which occurs even with brief spells of rainfall. Waterlogging crisis is an age-old unending nightmare for the city dwellers whose lives are becoming increasingly miserable. Before every city corporation elections, Mayoral candidates promise the voters about their commitment to solving this crisis but in reality everything remains all the same after the elections. After delivering rosy promises to make the capital a ‘green Dhaka’ during his election campaign, the newly elected mayor, industrialist Anisul Huq now tends to be certain about the uncertainty of the solution. He said in a recent interview, “I don’t know when this water-logging problem will end. All I can say is it will be under control in the near future.” Like all the previous mayors, he also started playing the same old blame game by accusing other private and government organizations for the crisis. The truth of the matter is that the new mayor Anisul Huq was never meant to be the savior for the masses as the way he has been sensationalized by the media. Rather he is an essential part of this corrupt democratic system and has been put into that position only to feed the greed of the capitalists and other beneficiaries of the regime. It is an open secret that bulk of the fund for various development projects of these cities goes into the pockets of ruling party men and their associates. 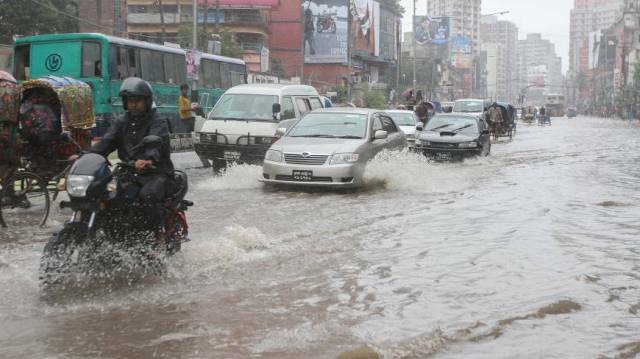 In the last four years more than 300 crores of Taka (nearly $400,000) was spent behind the projects to reduce water logging crisis of Dhaka with no visible positive outcome, and we know where the money actually went. A major factor for this crisis is the encroachment of the natural lakes and other water bodies of the cities by the politically-connected land grabbers. Filling up those lakes which act as buffer flood control reservoirs, for real estate business with tacit approval from the government has taken the crisis beyond solution. Moreover, these water bodies are connected to the Buriganga River, which is also being illegally occupied by the government backed organizations. This is the manmade evil system of democracy that exists to nourish certain privileged groups at the cost of people’s rights and interests. History is witness that people enjoyed civic amenities and facilities irrespective of their race and religion under the blessed ruling of the Khilafah. And it is only with the looming return of the Khilafah, city dwellers of Bangladesh would be able to get rid of this water logging misery. Lakes and other water reservoirs are considered as public properties in the eyes of the Shari’ah, and Khilafah will ensure that no groups with vested interests get to grab these properties causing irreparable harm to the environment. Discarding democracy and its treacherous leaders into the dustbin of history is the demand of the time now to put things in order. Previous PostHow is the Khilafah not a Priority When it is the Crown of all Obligations? !